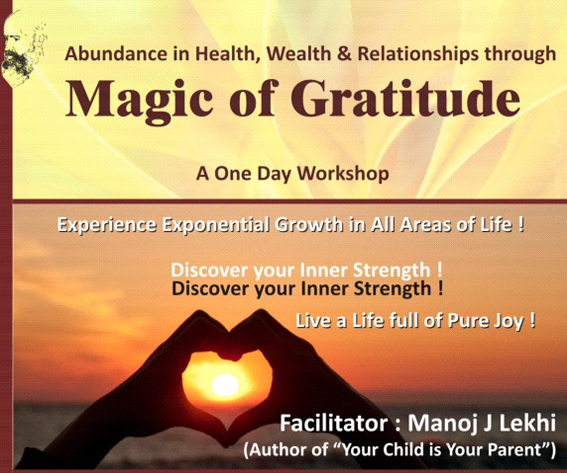 A unique one day seminar specially designed to take us deeper into our inward and outward journey by exploring and discovering ourselves through this ‘bhava’ of GRATEFULNESS ! The Seminar consists of 3 sessions where you experience inner actualization leading to 3 outcomes. Through meditation, “being with yourself “ sessions, group sharing and insightful talks and audio-visual presentations a transformation in our outlook and approach of life situations is experienced.